The Mediterranean Diet for Beginners: The Complete Guide-40 Delicious Recipes, 7-Day Diet Meal Plan, and 10 Tips for Success The Mediterranean Diet for Beginners offers a complete guide to the Mediterranean lifestyle, which emphasizes healthful living through delicious, fresh foods prepared with total well-being in mind. The Mayo Clinic calls the Mediterranean diet the "heart-healthy diet," and it's considered among the healthiest ways to eat on the planet. Through the 10 Tips for Success, a 7-Day Diet Meal Plan, and 40 delicious recipes, The Mediterranean Diet for Beginners takes you step-by-step into this transformative way of eating and living. The Mediterranean Diet for Beginners is the complete guide to a new way of living: The 10 Tips for Success ease your transition to a Mediterranean diet by presenting simple, attainable techniques that help you learn how to eat as much as what to eat. Refer to these tips often to keep yourself motivated The 7-Day Diet Meal Plan is about enjoying food, not depriving yourself. You'll learn just how wonderfully varied and abundant the Mediterranean diet is. Planning a week's worth of meals is easy with not only helpful hints for buying the freshest ingredients to prepare at home but also tips for ordering Mediterranean-diet-friendly dishes while dining out. 40 delicious recipes allow you to create scrumptious breakfasts, lunches, snacks, dinners, and desserts, such as the Mediterranean Omelet, Fresh Tomato Pasta Bowl, Dilly Baked Salmon, and Red Grapefruit Sorbet. The Mediterranean Diet for Beginners also helps you understand why the Mediterranean diet is so good for you. Its nutritious, low-fat foods are rich in disease-fighting, heart-healthful antioxidants and omega-3s. 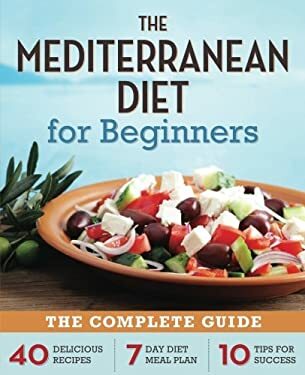 Start living the Mediterranean lifestyle today with The Mediterranean Diet for Beginners: The Complete Guide-40 Delicious Recipes, 7-Day Diet Meal Plan, and 10 Tips for Success." New (4111 available) BRAND NEW. Over 1.5 million happy customers. 100% money-back guarantee. Make your purchase count: support Better World Books' worldwide literacy partners.